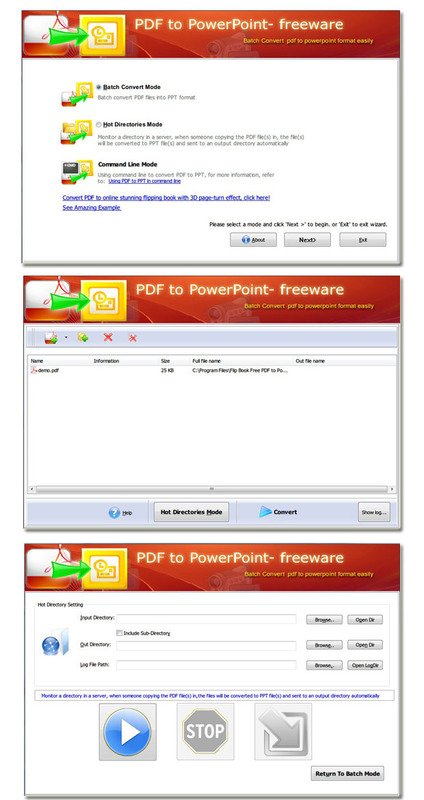 Flash Converter Free PDF to PPT 2.0 Free Download - Truly freeware to convert Adobe PDF to PPT presentation! Truly freeware to convert Adobe PDF to PPT presentation! Last Updated: 6/17/2012 | File Size: 1525 KB | License: Freeware | Downloads: 302 | Developer: PDF to Flash Converter Ltd. Flash Converter Free PPT to PDF is the easiest and most powerful PDF to PowerPoint PPT format converter, free to convert PDF to PPT slideshows without any payment. This Totally Free software provides Batch Convert, Hot Directory modes and Command Line Mode for you to convert large quantities of PDF files on the fly and turning those PDF documents to PPT file(s). Easy-to-use software suit for all levels user to creates flash book from PDF without any programming knowledge, coding skill. Just three simple steps: Choose Convert mode -&gt; Load PDF file(s) -&gt; convert to PPT file(s), then publish it for online share with your friends, company partners, clients in Facebook, Twitter, Myspace, Google, etc. Statement: First, please download the orginal installation package by clicking the download link. Of course you may also download it from the publisher's website. Using Flash Converter Free PDF to PPT crack, key, patch, serial number, registration code, keygen is illegal. The download file hosted at publisher website. We do not provide any download link points to Rapidshare, Hotfile, Depositfiles, Mediafire, Filefactory, etc. or obtained from file sharing programs such as Limewire, Kazaa, Imesh, Ares, BearShare, BitTorrent, WinMX etc. Software piracy is theft. If you like Flash Converter Free PDF to PPT please buy it.